when we complete our dream to take a home or buy a flat in an apartment we feel more happy but we don't satisfied with that. The thought of interior designing come in our mind but it’s an headache for us. Doing an interior designing of home is not an easy task it consumes too much time. While doing interior designing you have to think about color combination, lights, furniture, & you have to think about every corner of the home, so it take more time. Also you have to take care about that things like don't put simple or extra that feels more uncomfortable. So hire an interior designer to decorate your home is the best option for you. 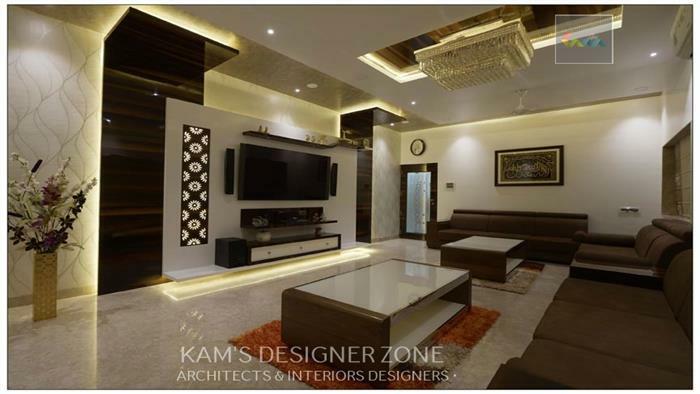 If you want Professional interior designer in Pune then Kams Designer Zone is the best option for you to complete your dream home. We can provide you ultimate solution in affordable budget. We decor home according to clients taste and preference. Simple photo frame or flower vase can increase the wonder of the room. According to space we have to do interior designing means use appropriate furniture according to room and also taking care of storage. Storage place is very important. Color plays an important role while doing an interior designing. We have good experience of residential and commercial interior designing so we can choose appropriate color for your residence. If you use different color shades then it gives unique, artistic look and feel more refreshing. So if you want any suggestion then you can consult with us.